We have been making our own ice cream for a couple years now. When we got our ice cream maker, we thought we would be making all these crazy flavors and experimenting all the time. And we do, however more times than not, we just make good ol', plain and simple, Vanilla. Dress it up however you want, each time you have a bowl you can change it up with a new flavor. It just never gets old. It's that simple. And easy to make. 5 simple ingredients, and a couple hours is all you need. We always make sure we keep the freezer bowl portion of our ice cream maker in the freezer so that it's ready for us, as soon as our ingredients are ready. We had to wait for the bowl once, and we never let that happen again! In medium bowl, combine milk, sugar, and salt. Using hand mixer, mix on low until sugar is dissolved. Once sugar is dissolved, add heavy cream and vanilla. Stir well. Cover bowl and refrigerate for at least two hours. Pour mixture into your ice cream maker, and follow manufacturer's instructions. Based on my maker, it will take about 20 minutes. Enjoy immediately as a soft-serve consistency, or return to freezer for a couple hours for a more firm ice cream. I should get my ice cream maker out and place it directly into the freezer right now. Vanilla ice cream is for sure a favourite! I do love homemade ice cream and have developed a number of recipes since I first got an ice cream maker. But my personal favorite is vanilla, sometimes on its own, sometimes dressed up with a few fresh berries or a little homemade jam. You've inspired me to make some this weekend. Vanilla is my favorite of all flavors, when I feel like something more I can add just about anything, love that you added strawberries, Yum! This looks delicious! 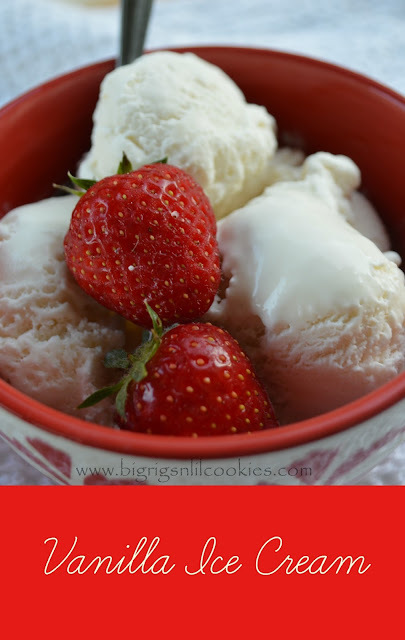 There's nothing better than a bowl of homemade vanilla ice cream! I've never made homemade icecream before but that sure does look yummy. I really want some. With a strawberry. In that pretty red bowl. Homemade ice cream is the best and it's hard to go wrong with vanilla. There are so many great topping options and it's so good on it's own too!